How Do You Add Complex Numbers by Graphing in the Complex Plane? 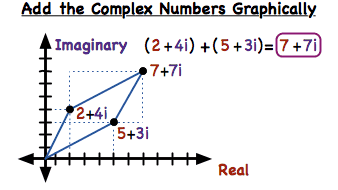 Did you know you can add two complex numbers together just by graphing them? This tutorial shows you how you can perform this addition on the complex plane! A parallelogram is a special type of quadrilateral with some special properties. In this tutorial, take a look at parallelograms and learn what kinds of quadrilaterals can also be called parallelograms! The coordinate plane has two axes: the horizontal and vertical axes. These two axes intersect one another at a point called the origin. Learn about the ordered pair that indicates the origin and its location in the coordinate plane by watching this tutorial! How Do You Graph Complex Numbers? To understand a complex number, it's important to understand where that number is located on the complex plane. This tutorial helps you practice graphing complex numbers! How Do You Add Complex Numbers? If you want to add complex numbers together, first regroup them so that like terms are next to one another. Then, add the like terms together, and you have your answer! To see an example, check out this tutorial.